Here is the list of the hotels near Andrésy. Book your hotel near Andrésy today, Friday 10 May for the best price, reservation and cancellation free of charge thanks to our partner Booking.com, leader in on-line hotels reservation. Below here is the list the 50 closest hotels of Andrésy, sortable according your criteria. You will find the position of these accommodations on the Andresy hotels map. Set on the banks of the Seine River, Comme un Poisson dans l'Eau is a self-catering holiday home located just 18 km from Versailles. It offers a furnished terrace facing the river, a garden and free Wi-Fi. The accommodation features a living room with sofa and flat-screen TV. It also includes a bathroom with shower and hairdryer, and a washing machine. Comme un Poisson dans l'Eau comes with a kitchen, equipped with a dishwasher, microwave and kitchenware. Restaurants and bars can be found in the area. Comme un Poisson dans l'Eau is 4 km from Saint-Germain-en-Laye and 20 km from Paris. Boasting barbecue facilities, Le Petit Val Rose features accommodation in Villennes-sur-Seine with free WiFi and garden views. Guests have a private terrace. The holiday home is composed of a dining area, a fully equipped kitchen, and 1 bathroom. A flat-screen TV and DVD player are featured. If you would like to discover the area, hiking is possible in the surroundings. Paris is 32 km from the holiday home, while Versailles is 22 km away. The nearest airport is Paris - Orly Airport, 47 km from the property. Located on the Île de Villennes Island, Ilvil is just in front of the Seine River and 300 metres from Villennes-sur-Seine Train Station, which leads directly to Paris. This apartment offers a garden and a furnished terrace with river views. With a private entrance, the apartment includes 2 bedrooms, a TV and a private bathroom with a hairdryer and a shower. Guests are able to prepare their own meals at Ilvil. The kitchen is equipped with an oven, a stove and a microwave. A fridge, a coffee machine and kitchenware are also provided. This property is 3.1 km from Touroparc and 3.4 km from Bethemont Golf Course. Activities in the surrounding area include cycling and hiking. The property offers free parking. Campanile Villennes-Sur-Seine - Poissy is 3 km from Orgeval and 6 km from Poissy, on the A13/A14 Motorway. It is also 1 km from Villennes-Sur-Seine RER Train Station, providing direct access to Paris. The property is 21 km from La Défense Business Quarter and 15 km from Versailles. All rooms at this 3-star hotel are en suite and feature air-conditioning, cable TV and free WiFi access. A buffet breakfast is served every morning. This Campanille hotel also has a restaurant that offers traditional and family style cuisine. Choose from buffet options, children’s menu and à la carte dishes. Vending machines with snacks and soft drinks are also available for guests' convenience. There is a 24-hour front desk at the property. The hotel is opposite Villenne Golf Course and free parking is available on site. Émile Zola Museum and Medan Castle are both located 1 km from the hotel. Situated on the edge of St Germain Forest, this hotel in the style of a country house offers rooms and apartments. Each one is unique and offers a cosy atmosphere. The accommodation at the Relais & Châteaux-Hotel Cazaudehore - La Forestière provides just the right blend of charm and modern comfort. Free tea and coffee are provided from 17:00 to 18:00, and room service is available until 22:45. The gourmet restaurant serves seasonal produce including a few dishes from the Southwest of France. In the wintertime you can relax by the fireplace. In the summertime enjoy lunch in the shady garden. Ibis budget Orgeval is 3 km from the centre of Orgeval. It offers free WiFi, a 24-hour front desk and air conditioning. Serviced by a lit, each room includes a flat-screen TV with cable channels. The private bathroom is fitted with a shower. Breakfast is served every morning at ibis budget Orgeval. Vending machines for drinks and snacks are provided on site. iBis Budget Orgeval is located 2 km from Villenes sur Seine Golf Course and 5 km from the A14 motorway. Free private parking is available at the property. With a quick link to Paris and La Défense business district on the RER train, Novotel Poissy Orgeval is a few minutes from Poissy's Technoparc and a 25-minute drive from Le Golf National. This 4-star hotel, 20 minutes from the La Défense business district, offers spacious rooms plus 300 m² of meeting rooms for conferences and seminars. You can enjoy innovative meals at the hotel's restaurant or on the terrace that overlooks the outdoor swimming pool. The Poissy Orgeval is also suitable for visitors with young children thanks to its play area with video games consoles and comics.There are also numerous golf courses nearby. Up to 2 children (16 years and under) stay free when sharing with parents. B&B Hôtel Orgeval offers accommodation in Orgeval. The 2-star hotel has air-conditioned rooms with a private bathroom and free WiFi. Each room is equipped with a flat-screen TV with cable channels. At the hotel, all rooms include a desk. All units feature a wardrobe. A buffet breakfast is available each morning at B&B Hôtel Orgeval. Paris is 32 km from the accommodation. Paris - Orly Airport is 46 km from the property. Apartment Morainvilliers Preferred hotel ! Situated in Morainvilliers, Appartements Morainvilliers offers accommodation with free WiFi and access to a garden with a barbecue. Some units also have a kitchenette equipped with a microwave. Hiking can be enjoyed nearby. Paris is 32 km from the apartment, while Versailles is 22 km from the property. The nearest airport is Paris - Orly Airport, 47 km from the property. 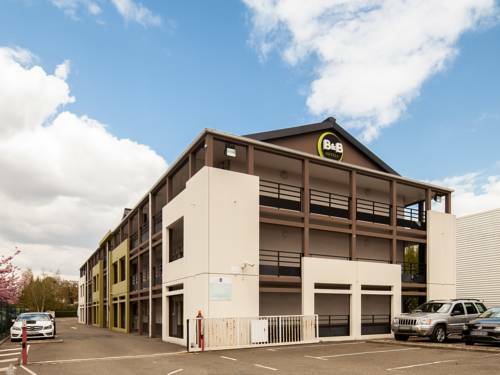 Ibis budget Chambourcy Saint Germain is situated in Chambourcy, 23 km from Paris and 15 minutes' by car from La Défense. Free WiFi is provided throughout the property and extra features include a terrace and a private garden. All rooms come with a flat-screen TV. Rooms include a private bathroom fitted with a shower. Buffet breakfast is served daily and several restaurants and supermarkets can be found within walking distance. An outdoor parking is available for hotel guests and guests arriving by car can access the hotel via the A13 motorway. Roissy-en-France is 36 km away and Paris - Orly Airport is 31 km from the property. Below here is the hotels map of Andrésy. Names and details of Andrésy hotels can be shown on the map clicking on the prices icons.